This card took me right out of my comfort zone it was made for my eldest granddaughter's 20th birthday... it was very much inspired by Sam Poole's work in fact the mannequin with wings is her stamp. There is lots of texture in here that doesn't show up well in this photo. The background was made by mistingcosmic shimmer through a mask, then spellbinders filigree trellis was torn and put on. 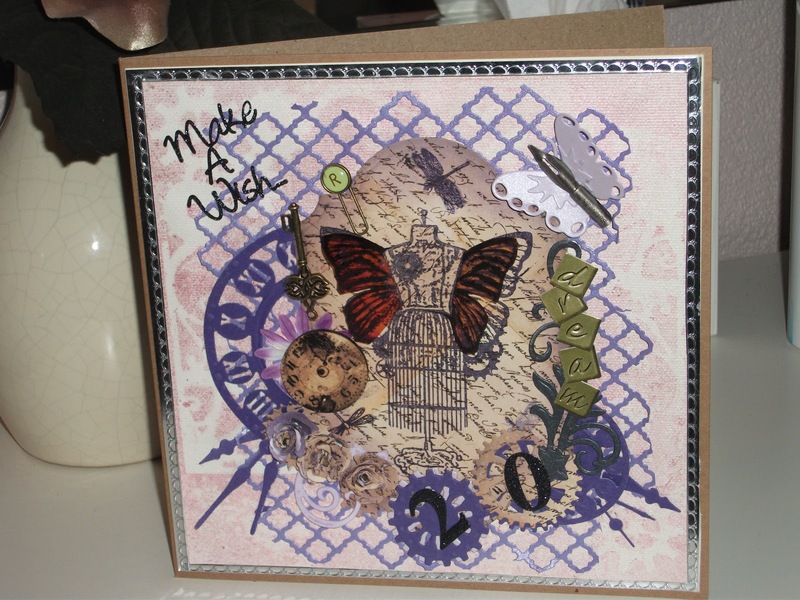 A couple of clockfaces and cogs and a butterfly with nib body were used. Wings were restamped on angelina film and attached, Flowers made from some dictionary pages were made and stuck on. It's what I call one of my 'pizza' cards where loads of toppings are put (thrown on). I was quite pleased with end result and Rhiannon loved it which is the main thing. I wanted to do something different and special for her because it was her first Birthday spent away from her friends and family because she was in her first term at College. This is what I love about making cards you can tailor them for the person .... even if it's only their fave colour or sport or hobby. The only thing is once you start giving them to people and then one time you have to give a bought one for whatever reason they look at you as if to say oh you didn't make me one this year? and I feel so guilty.